When I hear the slogan “Ring Around the the Collar”– it automatically brings me back to those classic “Ring Around the Collar” commercials on TV in the ’70’s and ’80’s. Well, Wisk has changed a little, but is still committed to fighting stains. A new version of the famous red bottle, Wisk with Stain Spectrum Technology, has just been introduced and I’ve been asked to test it out with my family over the next few weeks. Have you checked out Wisk’s new commercial ? The new, enhanced formula helps tackle stains — from proteins to carbohydrates to oils. I remember as a kid if I got something on my shirt (like grape juice or tomato sauce) it was ruined. But with new stain fighting formulas, that doesn’t have to be the case anymore. Ruined shirts could be a thing of the past. Now, with three young children, I’m constantly doing laundry and trying to get stains out. In the next two posts, I’ll be blasting these stains as I test out Wisk with Stain Spectrum technology. 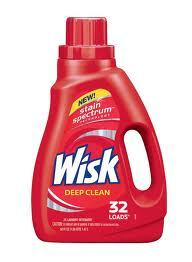 This post is sponsored by Wisk. I received monetary compensation for my participation, but my review and opinions are my own.